This game spans the generations: young children will enjoy this as a counting game; while two to four older players will enjoy it for the strategy. 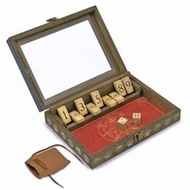 This heirloom-quality version of the classic seafaring game has a latching wooden box that features a transparent, shatterproof top and flipping wooden number tiles. It includes two dice, a convenient storage pouch and a detailed instruction booklet. Measures 12.7" x 9" x 3".